Does your workplace deserve to be recognized for their best arthritis practices? Nominate them by June 30, 2018. Canadian employers, working with their private health insurers, are increasingly looking for ways to promote patient-focused prevention, treatment and management of arthritis as part of a health and wellness program for employees. To recognize these best arthritis practices, Arthritis Consumer Experts (ACE) announces the search for Canada's Best Workplaces for Employees Living with Arthritis. ACE analyzes company practices and programs compared to other nominated companies. The judging criteria this year will focus on employer benefit plans, particularly drug plans that help people with arthritis gain access to life saving medications they and their doctors have decided they need. 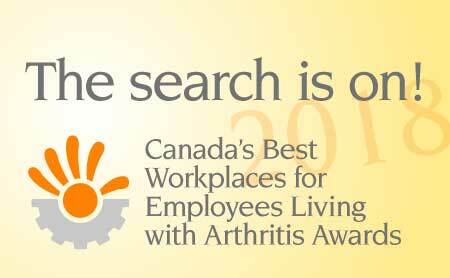 To nominate your company for Canada's Best Workplaces for Employees Living with Arthritis award, please click here. The deadline to apply is June 30, 2018. Please submit your nominations to awards@jointhealth.org.